When you appreciate clean, simple lines and understated style, then our range of Edwardian and Georgian conservatories are perfect for your home in Fleet, Hampshire, parts of Berkshire, Farnham, Camberley, Aldershot, Basingstoke, Hook, Surrey, Farnborough, Bagshot, Lightwater, Cove, Frimley, Yateley and surrounding areas. These conservatories are versatile and can suit almost any home. Contact us for more information. Our range of Edwardian and Georgian conservatories offer unrivalled sophisticated style. These spectacularly simple, yet beautiful, conservatories are available throughout Fleet, Hampshire, Farnham, Camberley, Aldershot, Basingstoke, Hook, Farnborough, Bagshot, Lightwater, Cove, Frimley and Yateley. They are similar to one another in that they are both either square or rectangular in shape, which maximises the available floor space, giving you the opportunity to have a truly versatile room. 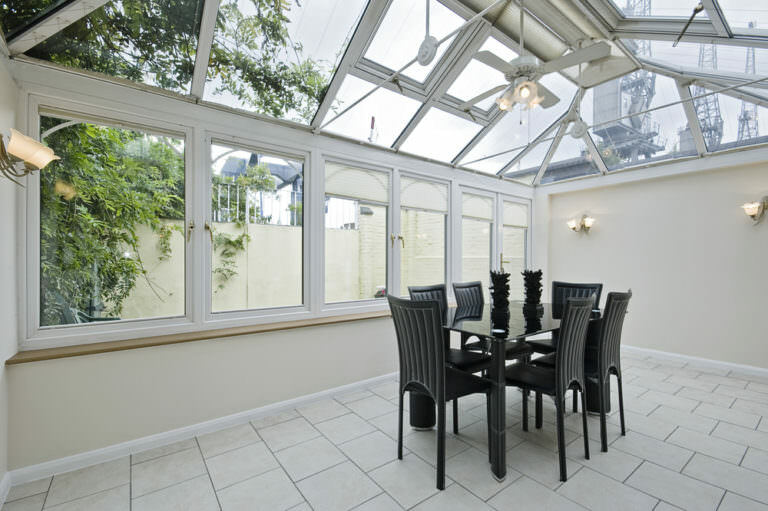 You can use your new conservatory as a dining room, or a playroom, even an office. They are created to be completely practical. In addition to this, our Edwardian and Georgian conservatories, manufactured by market leaders Ultraframe, are incredibly light and bright. The design ensures that no matter where they are placed, natural light will be able to flood in, brightening up your home and creating an airy and fresh space. The inherent minimalist style that comes with both of these conservatories means that they can be suited to almost any property. You will get endless pleasure from an Edwardian or Georgian conservatory, coupled with practical usage. The Edwardian and Georgian conservatory range comes in a unique square or rectangular shape. This means that you can make the most of the floor space, and enables you to have a variety of furniture. Your new conservatory will be versatile, meeting your needs for whatever plans for it you have. Using cutting edge glazing, our Edwardian and Georgian conservatories provide an incredible thermal performance. No matter how cold it gets outside, you will be cosy and warm in your new conservatory. They are also weather resistant and the roof is capable of withstanding several inches of snow. Our conservatories are fitted with high security locking mechanisms as standard. The design of our Georgian and Edwardian conservatories ensure that they can stand up to physical attacks. Using cutting edge techniques coupled with state of the art technology, our conservatories offer superb security for your family and home. As with any of our double glazing installations, we are able to offer a 10 year fully insured guarantee on our Edwardian and Georgian conservatories. This impressively comprehensive guarantee is in place to give you confidence in the exceptional quality and the long lasting performance of our conservatories. For the best Edwardian and Georgian conservatory prices in Fleet, Hampshire, Farnham, Camberley, Aldershot, Basingstoke, Hook, Farnborough, Bagshot, Lightwater, Cove, Frimley and Yateley, come to Cristal Windows. Our cost effective quotes will be a pleasant surprise, and they are simple to get too. Either visit our online quote calculator, or contact us, and you will be given a free quote tailored to your specifications.